Check out a new article that's been published on Empire Avenue and the Missions feature on Empire Avenue on how Social Media Missions are driving traffic and yielding real business results. Here are some very brief stats on Missions: Our members have paid out over 7.8 BILLION Eaves (yes you read that correctly) in Mission completions over this past year with over 2.8 MILLION Mission completions by our imaginative members! 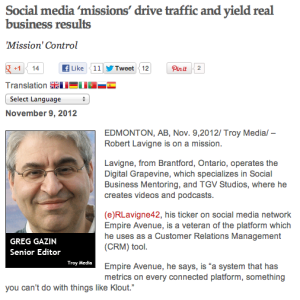 Want to drive Social Media, Empire Avenue Missions, that's definitely a tool that you should have in your toolbox. You need a certain amount of social media value and reputation to run Missions and that's what our Social Stock Market is for, drive your Social Media value and reputation then engage a hyper-engaged community to drive real-world value and engagement. Empire Avenue is Social Media Rocket Fuel!